In the late 1990's Palmerston North duo Andrew Carey and Regan O'Brien, formerly of The Livids, formed Trough and released their debut single, a limited edition of 27 lathe cut acetate discs called Sturdy – that single included a frenetic instrumental that expresses some of the excitement and pace of a horse race as it follows the cadence of the race caller from Avondale racecourse calling Race 10 from start to finish. 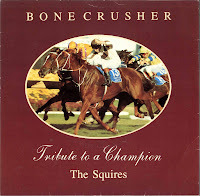 Over the years there have been a number of songs produced about champion horses such as Phar Lap, Sunline, Bonecrusher and Cardigan Bay. 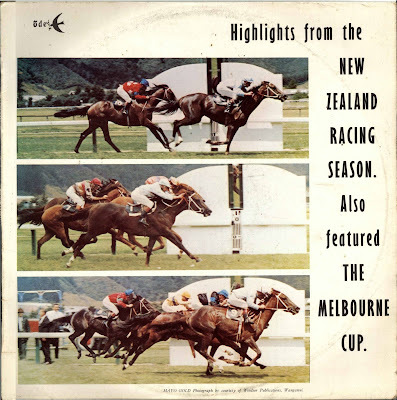 Cardigan Bay was born in Mataura, near Gore, but did much of his racing overseas. He was the first Standardbred horse to win a million US dollars and when he achieved that feat he appeared on US TV on the Ed Sullivan show. When Cardigan Bay died his obituary appeared in the New York Times. He's been toasted in song by Dusty Spittle, a NZ country veteran who has been inducted into the Australian Country Music hall of Fame and the American old time country hall of fame. He still performs around Otago today and I've put a clip of a recent performance on the video page. In the early part of this decade Phelps and Munro was producing critically acclaimed electronic music combining the warmth of sampled guitar with jittery glitches and beats. Phelps and Munro was actually the solo project of bedroom laptop musician Gerald Phillips. He released just one album, Slowpoke, on Round Trip Mars Records. That album included a song that received massive amounts of student radio airplay – a gentle but captivating instrumental based around an acoustic guitar sample with electronic stutter and starts called 'Horse Winning without Rider'. The final song in this episode is another from Danny McGirr, another performer still going strong after 50 years in the industry. I've put a video of a 50 yr anniversary performance by Danny on the video page. 'The Jockey's Last Ride' is apparently based on a true story about a young jockey's first cup race, although as you can tell from the title all does not end well. A kiwi country/folk classic that ticks all the boxes including the heroes ascent to heaven.